Sadly, people do get ripped off every day, and more people get taken advantage of when selling gold jewelry than the sale of anything else. Most people take their jewelry to jewelers, thinking this is the logical place to sell it. While that’s not a bad choice, there are other options. You owe it to yourself and the estate to shop around. Some go to coin shops, antique stores, or private collectors. Try locating places closest to the refinery; you are likely to make more money. Have sterling and gold identified as genuine. Do not sell it at this time; just get help in identifying it. Do not sell it in a rush, unless you have to. Find a local place that is close to a refinery, get a quote, then take it to jewelers. Do research online to see if you can find a local resource. 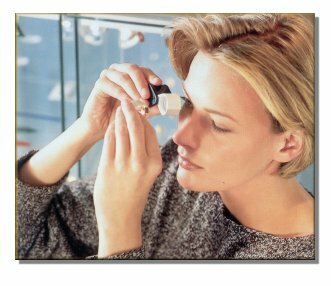 Most jewelers sell to refiners, so you may want to go straight to the source. Have your facts together first. It is worth taking jewelry to multiple places to get the most $$ you can. Pay attention to daily spot price of gold and silver, http://www.kitco.com. Prices fluctuate throughout the day every day. This site will give you a per ounce price. You need to understand that the per ounce they are referring to is pure bullion, pure gold, pure silver, NOT 14K, 10K, etc. These are not pure, so the spot price will not apply to a handful of 14K jewelry. The troy ounce is used in the weighing and pricing of precious metals: gold, platinum, and silver. The troy ounce is different from an ounce you would weigh on your kitchen scale. If you get into weighing metals, you will need a jewelers scale that includes troy ounces or “ozt.” You can buy an inexpensive jeweler’s scale online. Let’s say that gold is $1,300 per ounce. You will not get $1,300 per ounce for your 10K or 14K because it is not pure gold. So if you have 10K and the price of gold is $1,300 per ounce or $41.80 per gram, then the price of your jewelry is $41.80 x .4167 = $17.41/gram. If you have 10 grams of 10K at $17.41/gram, your scrap gold is worth $174.10. Remember, this is for illustrative purposes. The gold still has to be tested/assayed to determine the true percentage of gold. Keep gold coins separated, because they have numismatic value, as well as metal value. You can purchase your own gold testing kit, but it will be tested again when you go to sell it. Weigh your items by grouping together (10K, 14K, etc.). Use a loupe to look inside the piece to find a mark. Not all pieces are marked; this is why they should be tested. 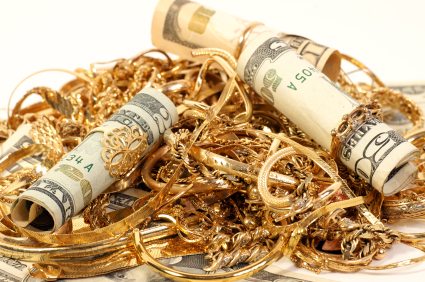 Scrap gold dealers in store fronts (“We Buy Gold”) will likely buy from you at 30-60% LESS than the gold’s worth. A jeweler will usually pay more than this. Be aware that often gemstones set in jewelry are not included in the offer. Those seem to just go along with the gold, which doesn’t seem fair to me. IF it is a large stone, you may want to have it removed from the setting BEFORE you scrap the gold. Please have the stone identified! Private collectors may offer a very fair price, if you can find them. Know the worth before you sell. Gold refiners pay 90% and sometimes more, but they may have a minimum weight requirement. Old dental gold is usually between 8K and 18K; it must be tested as well. If you dislike math, this helpful website for gold scrap weight conversion and melt value calculator will do the figuring for you: http://www.silverrecyclers.com/calculators/gold_calculator.aspx. For a list of reputable dealers in the U.S., see US Mint page on recommended coin and gold buyers: http://www.usmint.gov/mint_programs/american_eagles/index.cfm?action=lookup. Surely, you jest! While I always do my best to assist and even educate my clients so they can empower themselves to make the right decisions, there are some people I just can’t help. They won’t or can’t accept the whole picture. This person is one of them. Despite my best intentions, you just can’t squeeze blood from a turnip. The market will bear only what it will bear, and their cut glass or shoes or Hummels are really not that much different from the rest of ours. It is unfair to apply this kind of unreasonable thinking and pressure to a professional in the industry, who can only do their best in a very soft market. Often the blame and complaint lands on the estate professional, when in reality we have done our best, and our best just wasn’t good enough for the client. Some of this will fall back on how well we discussed “expectations” of what things will sell for. Other reasons for the motivations behind selling are numerous. Perhaps this person needs immediate financial relief from the sale of those items. Perhaps the person is not well. Maybe they really do believe their things are worth a fortune because they paid so much for them. As you’ve heard me say before, what you paid for something means nothing now. If I invest several hundred dollars in designer shoes, in the end, they are USED SHOES, designer or not. Perhaps she doesn’t want to see it, but I wouldn’t be The Estate Lady® if I didn’t reply with my usual flair. So, I gathered my senses, did some sales comparables online which I could share in the form of “SOLD” prices, in easy links they could click on. I wanted to show them ever so politely, that their things were not worth what they originally thought. They are not selling for thousands. They are selling for $25, maybe a little higher or lower. I get the feeling they didn’t like that. It took me a lot of time to find and send that information to them; I never heard back from them. I guess they just weren’t ready to hear what I had to say. I silently lifted up a quick prayer that no matter what challenges they were experiencing, someone out there could be more help to them than myself. Unfortunately, someone like that will never change their thinking no matter how much proof is offered. Many years and ample experience have taught me they would only be upset with me, even if I did my very best. Don’t take things just to take them! Boomers, take heed. As our parents pass away, the temptation to sock away their belongings is great, but take the time to really think about what you are doing. Don’t keep it because you think your children or grandchildren might change their minds one day. Don’t get stuck paying for ludicrous storage bills that far outweigh the value of what you place inside there. Don’t fall into the trap of being a storage for your kids either. In the blink of an eye, you will be wanting to downsize; the time has come to hold yourself accountable in all of this. It’s either you who will do it or your children will do it, so why not do it for them? TAKE only what is really special to you, because the kids will most likely not change their minds and it will be sold off for pennies on the dollar, when it falls in the hands of your children. TAKE photographs, because they take up less space but you still have the memory of the item(s). TIPS: Don’t sell, give away, or donate anything until a professional has examined it. So many boomers throw away or give away personal possessions worth a small fortune, simply because they don’t know the values. Tell everyone “no” until the appraiser has reviewed everything. The cost to pay a personal property appraiser is nothing compared to the value you could find, not to mention the peace of mind it will give you! Anything that can provide family history. Family heirlooms if they are wanted and will be cherished. Don’t force heirlooms on the children if their hearts aren’t in it. All items of perceived monetary value. Hire that appraiser to find out for sure! Rare or unusual items (some antiques fall into this category). If someone has room for them and wants them, that’s fine. It’s okay to sell them if no one wants them. Jewelry. Have items appraised first for fair market value, not replacement value. Items with historic significance. You may donate if no family wants them. Important documents. These must be kept together until they are all sorted through by the executor. Collections (gold, coins, guns, stamps, etc.). Always have them evaluated by a professional. It is unusual to find appraisers for different specialty collections. Antiques, artwork, paintings, sculpture. These must be evaluated by a professional. Military items. These items are sought by collectors but may also be vital to family history. Safes, safety deposit boxes, and their contents. Have a key or know where keys or passwords are located. Anything you cannot identify. Have a professional look at it for you. Don’t take things just to take them. Select a few sentimental items that are small enough for you to use or display in your home. Great family or marital strife can develop if you take too much. Remember, the more you take now, the more your children will have to deal with later. Just this week, I have received numerous emails from people who are very concerned about the falling values of their tangible assets and the soft market that we are currently experiencing. These emails have asked me on a personal level how I feel about this and how I explain this to my clients. This topic has touched a lot of nerves, which is why I have written about it recently, discussing what I am seeing at antiques shows and fairs, auctions, etc. It appears that people are beginning to awaken to the message I have been hollering for years; my message is a simple one. Don’t shoot the messenger because I am being upfront and honest with you, so that you can make solid, knowledgeable decisions regarding the items you want to sell (or not). The market is soft for several reasons, and the economy is just one of several problematic challenges we are all facing. Remember that as we lose our older loved ones, their possessions are, quite literally, flooding the market with traditional household furnishings. The problem is that there are not enough buyers for what’s coming on the market. The boomers have too much stuff and are trying to downsize. Their children have no interest in these items either. It all comes down to the Law of Supply & Demand. Too much supply and no demand drive prices south. Have something extraordinary? Demand will be high since supply is low, and the price will be driven up. The problem with this near-perfect synopsis of the current marketplace is what is extraordinary to you, and what is extraordinary to those of us in the industry, are two totally different things. The average person out there thinks what they have is extraordinary just because it may be labeled “antique.” This couldn’t be further from the truth and I need your help in spreading the message. “Extraordinary” exists only rarely like a flawless diamond. The earth provides them, but very seldom. This type of item will always attract buyers with deep pockets. A 150 year old Victorian marble-top dresser will not, because they are common, dreadfully heavy, and imposing. This style has fallen out of favor and very few are buying these kinds of items. When they do, the prices are low, far lower than the owner feels it should be. Will they ever come back in fashion, or will they ever go up in value? I’m not really sure. I think it is going to be a long while before values start heading north. Another example of extraordinary would be owning Joe DiMaggio’s uniform, with pictures of him wearing it while standing next to his wife, Marilyn Monroe, and a letter from Joe giving you this uniform. THAT’S extraordinary! You have a group of rare items along with provenance of where it came from; serious baseball collectors would be vying for it. I have taken much time to communicate extensively with my colleagues across the U.S. to discuss the economy and its effect on our clients. When times are bad, people turn to selling hard assets, and when they can’t sell them or they sell for very little, people have a tendency to get very upset. Who could blame them? We are all in agreement that exceptional items will always sell for exceptional prices, but these are few and far between. Is there a solution to this terrible situation that has befallen us? Sometimes I wish I had that crystal ball, but since I don’t, I would encourage all of you. When you consider selling your possessions or heirlooms, first have them professionally looked at by someone who knows exactly what they are doing, not your Aunt Betty’s neighbor or friend who dabbles in stuff. You need someone who understands not only the market, but the trends we are currently seeing from region to region. Most of all, the best advice I can offer is to go into it with neutral expectations. I know mom always thought it was worth a fortune, but chances are it was worth a fortune to her. If mom paid $5,000 for a designer piece, look at the time period when she purchased it or had it appraised. Those days are long gone! Something is worth what someone will give you for it. It has become a buyer’s market and buyers are more frugal because they know this. Most of us enjoy hearing those words during a wedding ceremony, where the new couple is floating in bliss and envision being by each other’s side until death separates them. From my perspective, however, I see people who have a very passionate relationship with their material possessions, sometimes more so than each other! If I didn’t know better, I would say they behave as if they can take their possessions with them when they leave this earth, but we know that we can’t take stuff with us. I have seen it all. In all those years of estate work, I have tried to figure out why people have such a hard time “letting go.” Often, the Depression Era generation is the one that has accumulated the most, in my experience. Their parents did not have much and probably possessed more utilitarian items because of the era in which they lived. When their parents passed away, they did not distribute or sell those items … they absorbed them. The boomers have multiple generations of stuff to deal with when their Depression Era parents pass away. There are so many things I could use this for. I did without as a child and I will not do without again. They bring comfort and familiarity. Too overwhelmed to let it go — emotional attachment. I’ll let my kids deal with this after I’m gone. As an appraiser of residential contents, this is the part where I try to put my clients at ease. When in doubt, always have the contents of an estate appraised prior to distributing or selling contents. Most times, the heirs are not surprised to learn that much of what mom and dad amassed doesn’t have much value. Some children feel that items might be “junk” and some pieces do turn out to have significant value, pleasantly surprising them. Family stories through the years can add to the anticipation that great-grandfather’s chair is more valuable because it is so old, but age is not the only factor of value. There are many more characteristics of value we look at to determine it’s worth. Another important issue that the older generation should realize is that many of their heirs already have houses that are full of accumulation from 25+ years of marriage. Adding more stuff will only fuel marital strife. I’ve seen divorces happen over keeping too much stuff. Some kids keep items to sell, others for sentimental reasons. others because they feel guilt because “mother would kill me if I didn’t keep this.” The younger generation appear to want nothing but cash assets. Even if your children do take a few items, their children definitely don’t want them now, and most likely will feel the same in the future. They are not interested in antiques or traditional possessions when they could take the cash and go to IKEA or Pottery Barn. This is the trend. Holding on to possessions because you don’t want to let them go will leave a massive burden on your children. Gifting now and making plans for the distribution of your possessions while you are still here (and in control of those decisions) is the best plan of action. Take it from one who knows!